Star Monsters can be found in Star Force Areas marked with a red Star sign in the World Map. The portals linking to these areas are shining in red color to indicate the danger. While everyone can enter Star Force Areas and fight Star Monsters, only characters whose total equipment star level meets the requirement can deal enough damage and ultimately kill them. Star Monsters will not attack players proactively, unless they are under attack. Upon entering a Star Force Area, a message will pop up and show the minimum star level requirement for this area. A Star Level UI will also pop up to display character's current star level. Want to give your favorite gear a few shining stars, but don't have an Advanced Equip Enhancement Scroll? Similar to using Advanced Equip Enhancement Scrolls, Star Force Enhancement gives and increases star level to items with no more upgrade slots, but only at meso cost and a much lower risk. And it still works hand-in-hand with AEE scrolls. With this new enhancement system, players now have an alternative path towards acquiring gear enhancements, making it easier for them to upgrade their equips. Because we didn't release Miraculous Enhancement Scrolls which caused an imbalance in KMS, we are keeping the max number of stars for high-level equipment at 15 for now, but we will be reviewing this in the future. Additionally, many of the prices for higher enhancements have been lowered slightly from the KMS prices. Click on the Equipment Enchant button at the bottom right of the Item Inventory window. Drag the target equipment into the new pop-up window. If the target equipment has no upgrade slots available, the Star Force Enhancement UI will pop up by default. Otherwise, Spell Trace enhancement UI will show instead. The maximum star level depends on the level of target equipment. The possible maximum is 15 stars. 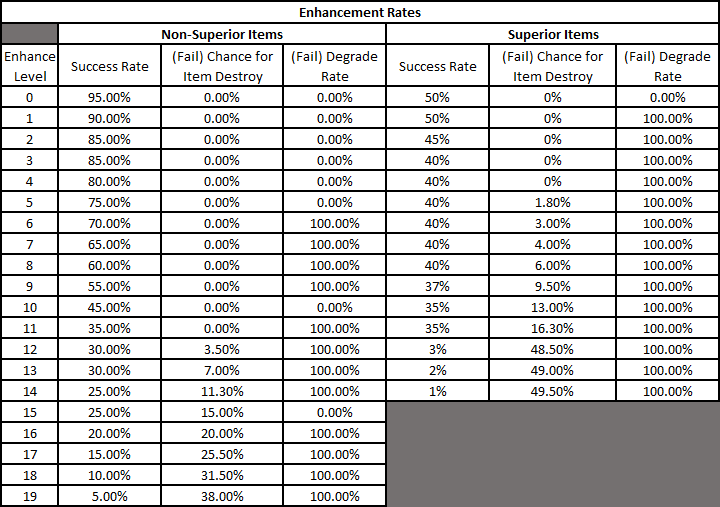 Each enhancement attempt charges a meso cost regardless of the result. The cost scales with the star level of the target equipment. Once you have started Star Force Enhancement, a mini game window will pop up. Successful completion of the mini game will increase the success rate of the enhancement. If two failed attempts caused the star level to drop twice in a row, the next enhancement will be a guaranteed success. Once the target equipment has reached 10 stars, its star level will not drop below this level for future failed enhancement attempts. This is only for non-Superior equipment. Should the target equipment be destroyed during enhancement, you will receive an "Equipment Trace" that records all the stats of the destroyed equipment prior to using Star Force. Applying the "Equipment Trace" to a clean version of the same equipment (via Equipment Trace tab in the star enhancement window) will restore these stats - including Potentials, Bonus Potentials, Souls, and Nebulites - to the new equipment (star levels at the time of destruction will not be restored). Protection Scrolls, Shielding Wards, and Superior Shielding Wards cannot be used with the Star Force Enhancement system. If the target equipment has previously been enhanced by Advanced Equip Enhancement Scroll, further enhancement using Star Force will continue from that star level, and vice versa. However, if a piece of Star Force enhanced equipment is destroyed by Advanced Enhancement Scroll, players will not receive "Equipment Trace". If a piece of equipment has acquired more stars than what is allowed by the equipment level requirement, it will also retain the star level and bonus stats, but cannot be further enhanced via the Star Force Enhancement. There are now areas and monsters that have been affected by the Star Force system! Certain areas have been converted to Starstruck areas that contain Starstruck monsters. Monsters in Starstruck areas will not take damage unless you have a minimum number of Star Force across all your equipped gear. You can check the amount of Star Force needed by viewing the area in the World Map; the number of stars needed will be located above the area name.